We landed in Jaisalmer at 5am on a cool morning and, swaddled in a fluffy pink blanket bought expressly for the night-bus, we drank sweet masala chai for an hour. A short tuk-tuk ride then dropped us at the outer gate of the fort and for the second time in my life I had the pleasure of walking up into this sandstone marvel in the desert a hundred kilometres from the border with Pakistan. We are here to volunteer at a small hotel inside the fort. The owner, Mr Ba (or Ba), is a local desert man from a village 60-kilometres away and having run camel safaris for many years the hotel is a new venture for him. Our remit, as we understand it, is to help him manage and develop the internet side of his business, advise on the camel operation side of things and generally bring some new ideas to the place. The thought of being in Jaisalmer for 2-weeks was hugely appealing and had played a large part in our choice, as had the prospect of riding across the sand dunes on camels wrapped in flowing robes a la Peter O’Toole! The hotel itself is just off the main entrance square, adjacent to the Royal Palace and fairly central in the general layout. Ba greeted us with big smiles and more cups of even sweeter chai were soon warming our hands. After a brief chat, during which we soon gathered that Ba’s grasp of the English language was far below what we had assumed, we were handed a sheath of loose papers and told to look on Google Drive for an overview prepared by the outgoing pair of volunteers. This overview gave us a snapshot of things as they were so we started to go through them one by one in more detail. This is where the real ‘fun’ began. If there had been more paper to chase one could have given it a name but as almost everything seemed to be online it was more of a screen dash across websites and emails from one item to the next. A picture was emerging but a fairly chaotic one. Porridge arrived courtesy of the ever-smiling ‘Mr Ba’. We drew our breath, warmed hands again and ate. On resuming the initial review I asked Ba, who hovered in the background, how he had completed most of the online applications. He hadn’t! In fact not only was his English basic but he couldn’t read or write in English either. As it dawned on us that all the emails we had received from Ba had in fact been written by other volunteers we began to understand how this operation was being run. Here was a simple man from a desert village who had jumped into hotel management on the strength of connections made during his camel safari days. Now wanting to increase his internet presence he – or a friend – had had the inspired idea of getting western tourists to fill this gap in his business plan. Not only that but they brought their own tablets and laptops with them. Feeling a need to get settled in we asked to go to our room and were led downstairs. Now I can sleep – and have slept – pretty much everywhere in my time so not much fazes me. But perhaps I have grown softer in middle-age? Thus, the windowless room next to the kitchen with two wooden Indian charpoy beds decked with thin cotton mattresses and rough blankets was not a sight that filled me with joy. We unpacked and went for a walk to discuss our situation. I felt bad as this was a place of my choosing – the Peter O’Toole fantasy again! I also felt annoyed with myself for having assumed certain details such as the literacy of our host and for having dragged Grace into what was looking like a bit of a mess. She on the other hand was far more upbeat (Women, amazing!). With remarkable sang froid she explained how this should be seen as a real challenge and not just some parachuting in a consultant type exercise. We had committed to a period of time here and should honour that obligation. We returned to the Hotel Mirage (the irony is in the name) and were treated to a simple stuffed Paratha and curd by Ba. Hmmmm. The afternoon revealed more and more missed communications, unfinished business and disparity across a whole raft of websites. The mountain was rising up before us. We sat Ba down and tried to elicit where he and the hotel where heading and how we could formulate a sustainable plan for him. Did he plan to get his own computer at any point in the future? “Why, it would be like a toy to me”. “Did he want to improve his English reading and writing? “Yes, yes, yes, English OK”. What happens when there are no volunteers here? “Everything OK, always people to help’. I think by now you can imagine the look on my face and the sort of uphill task we faced. Good, another huge edge to work our way up to, along, around, whatever. India, as is her wont, was throwing us a very curved ball and we needed to adapt accordingly. After an uncomfortable and not altogether warm night on our charpoys we made our first tactical move and decided to relocate. In the interests of market research both for Mr Ba and ourselves we visited around 10 hotels within the fort walls and appraised them in terms of price, quality, location, etc,. Lord Krishna himself must have been smiling down on us from his Himalayan paradise as we found a beautiful old ‘haveli’ – wealthy merchant’s house – right on the edge of the fort wall with a great view out over the desert from one of the 99 bastions which link the main defence walls together. Explaining to Ba as diplomatically as we could that it would be better for us to be elsewhere we were packed and moved in no time. Standing in our light-filled, comfortable and charming new room was a fresh start in terms of our state of mind and enthusiasm for the project. Back online we continued to arrange and consolidate a stash of emails and details into a campaign plan that we believed we could accomplish in the circumstances. There were booking website agreements to complete and sign and we read the fine print and discussed their suitability for Hotel Mirage. Some were rejected at source, others needed greater scrutiny and some discussion with Ba. This was not always easy but we finally pinned him down and managed to get most of the form complete – I honestly think he would have signed whatever was put in front of him. One item remained unanswered, his bank SWIFT code necessary for international payments from the booking company whose headquarters was in Thailand. I asked Ba if he could telephone his bank for this but only met with a “No problem, I get later”. I completed the form, had it scanned and emailed it to the company. If this was how business is conducted in India then so be it. 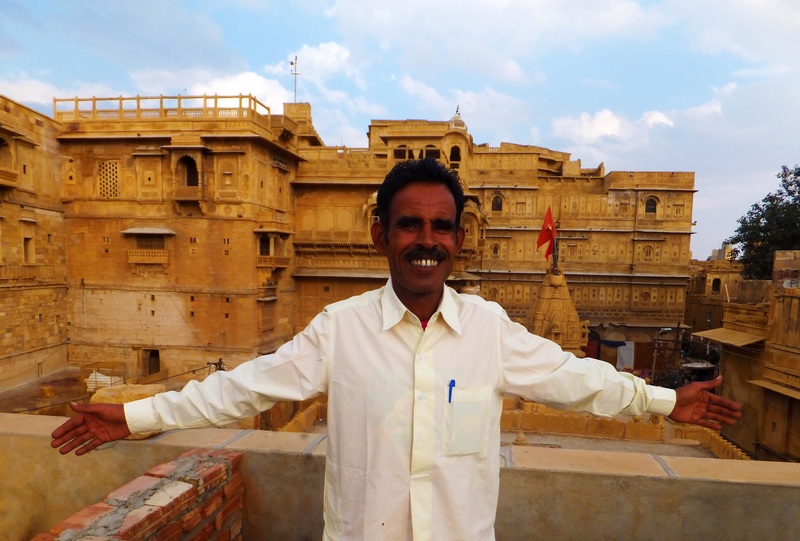 We also looked at a calendar dealing with future volunteers and saw that two 18-year old German lads had suggested that they might be heading to Jaisalmer in a weeks time. A lightbulb flashed on and we saw our opportunity to jump ship whilst also fulfilling our commitment. A chaser email was immediately sent. In the meantime we diligently updated as much as we could get access to. A one-month old website lacked a password and Ba had no knowledge of how to contact the creator, a Canadian currently in Nepal. It was already out of date and needed some re-writing and improving of photographs. Also of huge importance was a Government of India initiative to streamline registration of guests at all accommodation providers across the sub-continent. Again this required internet access, a computer and someone capable of entering the date in English and uploading a picture of the guest. This was not a complicated procedure but went largely by the board. Another variable floating amongst a host of others was a rather apologetic and dithery Japanese guest who seemed to be helping Ba with some taking of orders and food preparation. One day I saw Hiroko sitting at a laptop and assumed she was occupied with her own matters. Grace and I were getting on with our online updates when she came over and asked if we had registered certain guests online. We shot glances at each other as this was supposedly our business. My head went into my hands – again – and the yarn unravelled just a little more. So, after 4-days of sporadic but focused application we held council over a sunset beer and quantified our situation. It was somewhat akin to our time on the work retreat on the community when after a certain amount of anguish we realised that we had to accept that there was only so much we could achieve and that we had to accept that or go stark raving mad in the process. Ever the perfectionists and hating to do things by halves this is never an easy notion to swallow. Nothing that we might advise had any likelihood of being implemented in the short-term. Mr Ba had a system that was hugely vulnerable and lacked continuity. He basically had very little real control over the whole online aspect of his business and was reliant on a – hopefully – steady supply of largely untrained volunteers of different nationalities. It was working now but was potentially building up problems for the future if things were not streamlined and kept consistent across all platforms. His excellent Trip Advisor reviews could all be undermined if they were not backed up by an efficient booking process. Going online could be Mr Ba’s undoing and much as the little guy drove me round the twist at times he was a gentle and likeable soul. Krishna again smiled on us later the same evening and we received a reply from the next two volunteers. They were inbound in a few days. We told Ba and then focused on getting everything – or as much as we could – all in a suitable shape to handover. I drafted a business review for new volunteers to read stressing the importance of KISS – keeping it all short and simple. Grace worked on providing and updating a good folder of up to date and professional looking photographs to use online – some of the existing ones were dreadful or irrelevant. It was all pulling together into a much more coherent whole and finally we began to feel some sense of achievement. We had come up against an enormous cultural chasm in terms of how businesses are run and had managed not to fall into it – even if there had been a moment or two of hanging on by the fingernails! (for me at least). Lukas and Hans arrived on time, we handed over a comprehensive folder on Google Drive for their perusal and edification and also a hot list of things to attend to with the utmost urgency. As for Ba, we felt we could not leave him without just flagging up a few warning message. First and foremost, read the fine print – or at least get someone to read it to you. Beware trying to do too much – especially online – when you cannot control it yourself. I suggested that perhaps a local IT person would work much better in keeping things on an even track. Ba nodded. Ba smiled. Ba said nothing much at all. This entry was posted in India, travel and tagged business, change, east meets west, India, jaisalmer, tourism, travel, volunteering by Ashby's World. Bookmark the permalink. Two men recently scaled a sheer mountain in the Yosemite…took several days and wore their fingers to the bone( literally). Wouldn’t this have been simpler than coping with Bo? Do plan things better! tra Rosie.